Get the best value on holiday coloring in this Mega Holiday Bundle that includes all 5 seasonal coloring bundles! 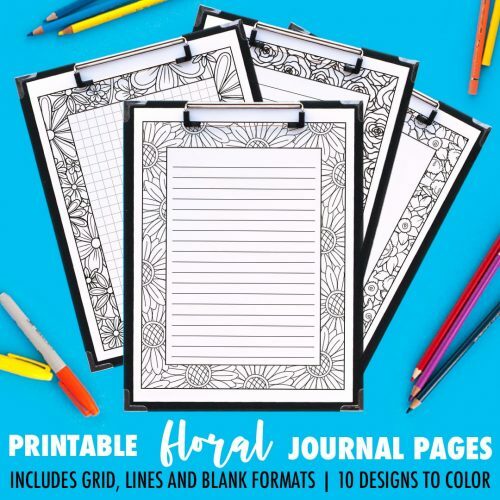 With over 300 pages of coloring activities, you'll never be short of ideas for personalized gifts, cards or things to make. If you bought each item separately, you'd be paying over $130 for all these items. If you bought the individual bundles, you'd still be paying $64. So if you're thinking about purchasing several of these bundles, this is by far the best value. and a blank version to get your creative juices flowing! Find the perfect fit for your preferred journaling style, whether you like to write, draw or use a bullet journal. Each page is designed to print on a standard US Letter paper, but you can also use your "scale to print" function to resize them to any size you would like to include them in your current planner. This is one of six printable coloring journal page packs available on my website. You can get all six packs (240 pages total!) in my Printable Journal Pages Bundle. It's time for a tea party! 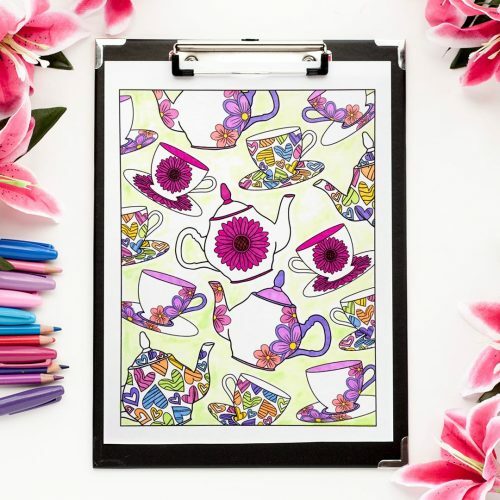 This coloring page includes some cute tea cups and tea pots for a fun and colorful tea party. I hope you enjoy it! This page is included in my Mother's Day Coloring Bundle. This girl coloring page is perfect for the intermediate or advanced colorist, with opportunities to practice your blending, skin tones and hair coloring. This page is included in my Mother's Day Coloring Bundle. 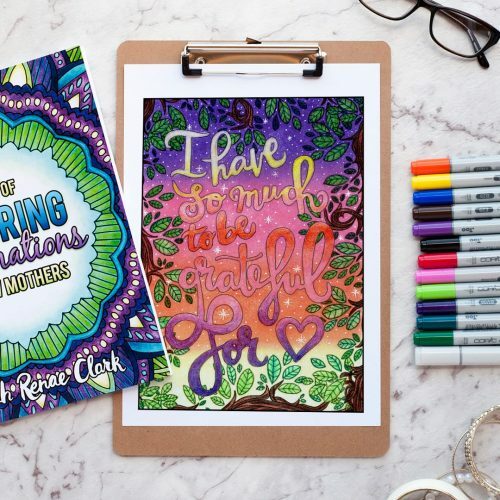 Spoil mom with this Mother's Day Coloring Bundle! 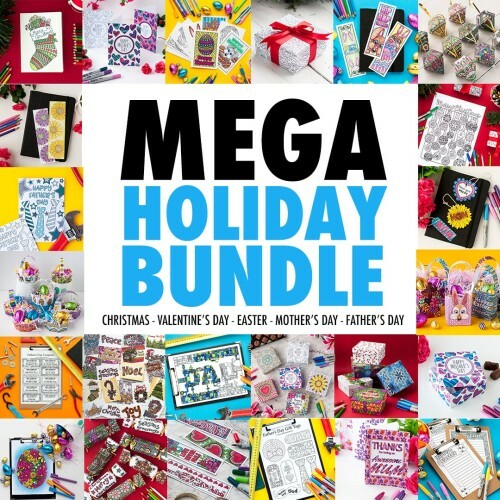 This bundle includes 58 pages of coloring activities to make a special gift for mom or for mom to color for herself. Both UK and US spelling variations have been included, so it's the perfect gift for your mom or mum! Spoil mom with these printable Mother’s Day Coupons! 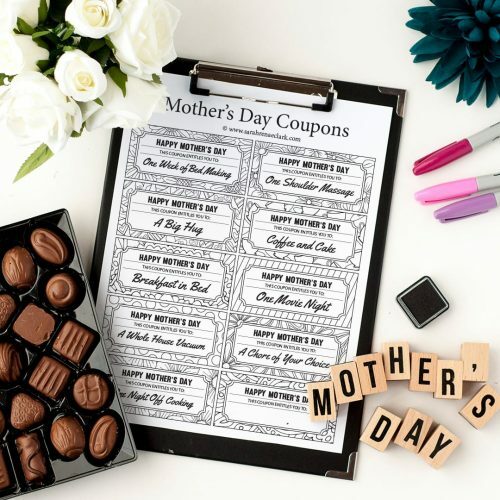 The coupons include breakfast in bed, coffee and cake, massages, hugs, chores, nights out and a blank coupon to create your own special offer for mom to claim whenever she likes. There are 10 printable coupons included, each with a different background to color in. Need a Mother's Day card too? Find more Mother’s Day printables and coloring pages in my shop. This free printable Mother's Day gift box template is the perfect way to personalize your Mother's Day gift. The box comes as two 8.5 x 11" black and white pages - one for the base and one for the lid. Color in your template, then cut along the solid lines, fold along the dotted lines, and glue the panels together to make your box. You can see the video tutorial and step-by-step photo instructions on my blog post. 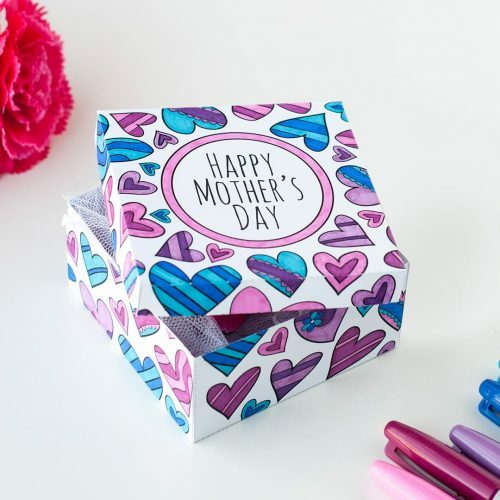 These printable Mother's Day gift boxes are the perfect way to personalize your Mother's Day gift. Each box comes as two 8.5 x 11" black and white PDF templates - one for the base and one for the lid. Color in your templates, then cut along the solid lines, fold along the dotted lines, and glue the panels together to make your box. This pack includes 6 different box designs, so you can use them for other special occasions too! You can see the video tutorial and step-by-step photo instructions on my blog post. These Mother's Day letterheads are the perfect stationery for a letter to your mom on Mother's Day. There are three designs available, including hearts, flowers and a tea party theme. The letterheads are 8.5 x 11 inches (letter size) but can be scaled to print for smaller letters. If you're looking for a gift for mom too, find more Mother’s Day printables and coloring pages in my shop. 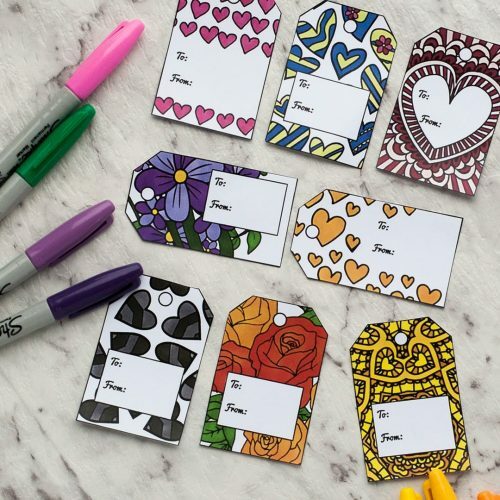 Color and make these Mother's Day gift tags to add to a special gift for your mother. 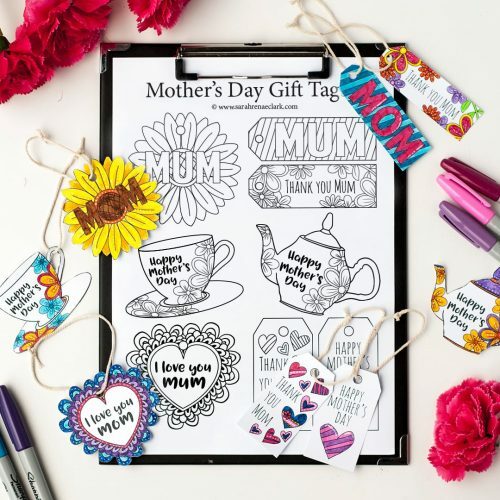 These printable Mother's Day gift tags are super easy to make and there are 8 different black and white designs to choose from, with a variety of different shapes and styles. Both "mom" and "mum" spellings are included for each design. If you're looking for a gift for mom too, find more Mother’s Day printables and coloring pages in my shop. Color and make these Mother's Day bookmarks for a special mom! 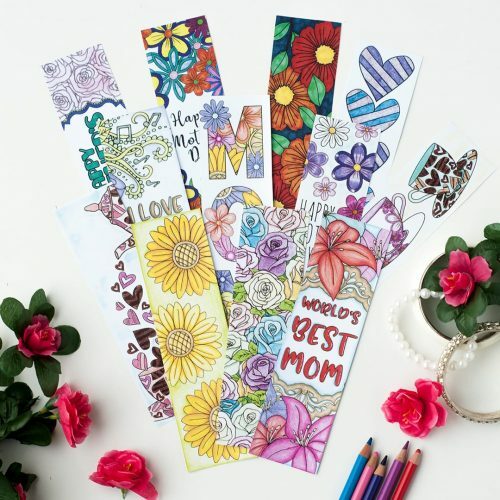 These printable Mother's Day bookmarks are super easy to make and there are 12 different black and white designs to choose from. Both "mom" and "mum" spellings are included for each design. Find more Mother’s Day printables and coloring pages in my shop. This printable Mother's Day card is easy to make and fun to color in! There are three versions included in this free download, including two colored printable cards and one that you can color in yourself. The card template prints on a standard letter size page (8.5 x 11") and includes cut and fold lines. The final card folds to approximately 5 x 7" You can scale the print to fit A4 printers or to print smaller cards if you prefer. You can get the whole pack of 8 different Mother's Day cards HERE. These printable Mother's Day cards are easy to make and fun to color in! Each Mother's Day coloring card template prints on a standard letter size page (8.5 x 11") and includes cut and fold lines. The final cards fold to approximately 5 x 7" You can scale the print to fit A4 printers or to print smaller cards if you prefer. All of the cards are black and white coloring page designs for you to color yourself. I've included a bonus colored version of one of the cards. The files include both "mom" and "mum" spelling versions of each card as separate PDFs. 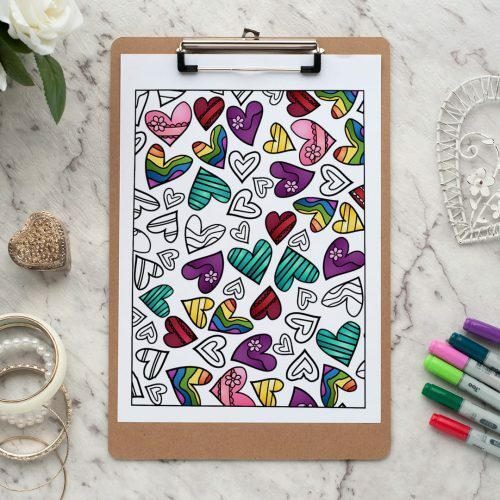 This heart burst adult coloring page is a great gift for Valentine's Day, an anniversary or just for someone you love. This adult coloring page is included in my Valentine's Day Printable Activity Pack - check it out HERE. This adult coloring page is a great gift for Valentine's Day, an anniversary or just for someone you love. This page is included in my Valentine's Day Printable Activity Pack - check it out HERE. These printable coloring gift tags are the perfect addition to any Valentine's Day gift, Mother's Day gift, anniversary gift or just for a good friend! They are super easy to make, and there are 8 different black and white designs to choose from. These gift tags are included in my huge Valentine's Day Printable Activity Pack - check it out HERE. 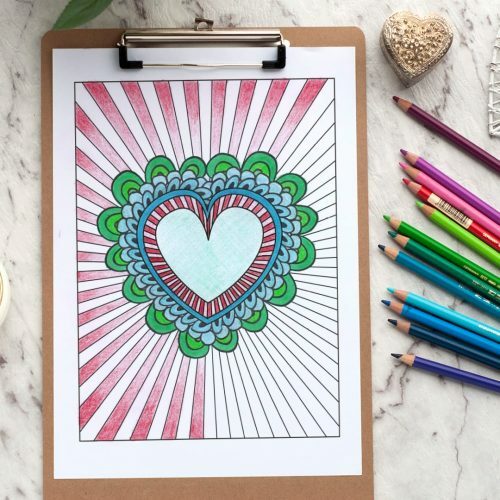 "My baby loves me" When you need this reminder, combine the therapeutic art of coloring with the power of positive thinking with this affirmation coloring page! This printable coloring page is a sample from my book "A Year of Coloring Affirmations for New Mothers". The book includes 52 coloring pages of positive affirmations, and many are not just for moms! It includes quotes like "It's OK to as for help, I am not alone", "Every day gets a little bit easier", "I have so much to be grateful for", "I am strong enough to fight my insecurities", "I know that everything is going to be OK", This too shall pass", and so many more. So even if you're not a new mother, why stop at one page? 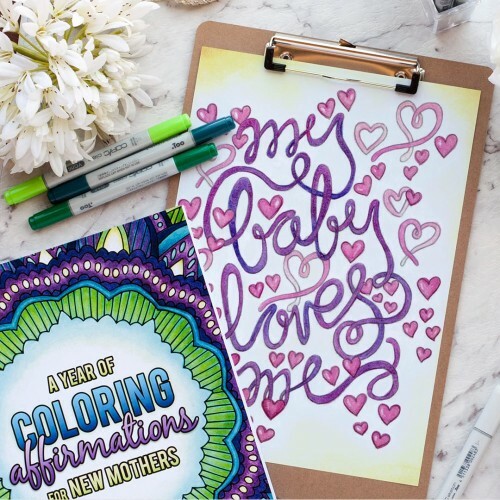 You can download and print the whole Coloring Book "A Year of Affirmations for New Mothers" with 52 coloring pages for only $5.95! Get it HERE. 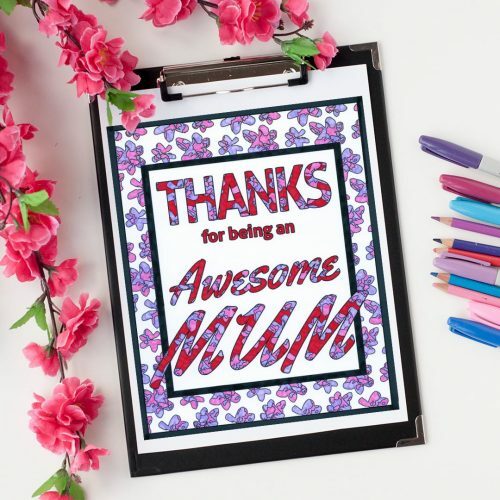 This free coloring page is a Mother's Day message that says "Thanks for Being an Awesome Mom". I've provided an alternate version with the spelling "Mum". If you like it, please use the links below to share with your friends! 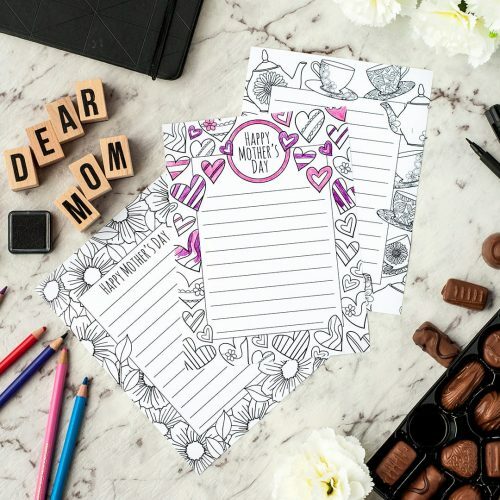 If you're looking for a great Mother's Day gift, please check out my range of other Mother's Day coloring pages, gift boxes, cards, gift tags and more - get it all here. Everyone loves free coloring pages! So please enjoy this new free page from my collection. 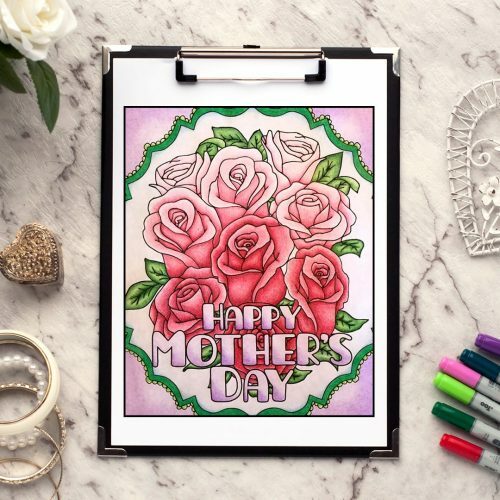 This free coloring page is a Mother's Day message with roses, created from hand drawn artwork that has been digitally edited. If you like it, please use the links below to share with your friends! 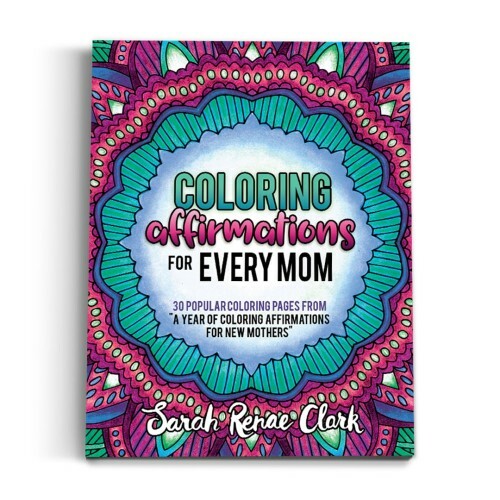 If you're looking for a great Mother's Day gift, why not add my new Coloring Affirmations book for Mothers printable book to your cart too!